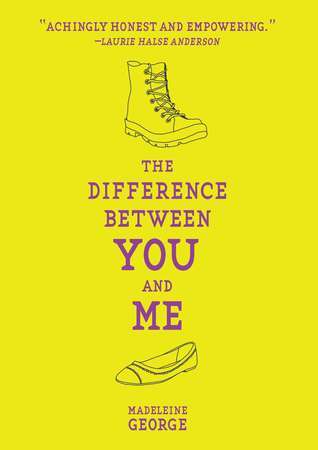 The Difference Between You and Me by Madeleine George. Viking, 2012. Currently Available. Face Value: There are two covers for this book, and the one I picked up from my library (left) is great. Bright colors and simple line drawings, the space between Jesse’s boot and Emily’s ballet flat evokes the characters and the story without telling us too much. It’s so much better than this alternate cover (right), which is, boringly, two people kissing, and since you can’t see the faces you can’t even tell that it’s too girls kissing. Plus that awful curlicue font and pink/purple detailing doesn’t serve the book at all. But I should be clear – let’s celebrate the fact that the simple, lovely, line-drawing cover seems to be the one released out in the wild! Thanks publishers! Does it Break the Slate? Totally. I love when an author lets her characters be fabulously flawed, but still self-determined, strong characters. Plus, the fact that these characters are all, in their own ways, politically involved, is a great modeling of how to be an activist in your community. Who would we give it to? There’s been a ton of great, not-over-issue-y Gay YA recently! This is fabulous – I hope we keep seeing more funny, sharp literature that features non-hetero protagonists. 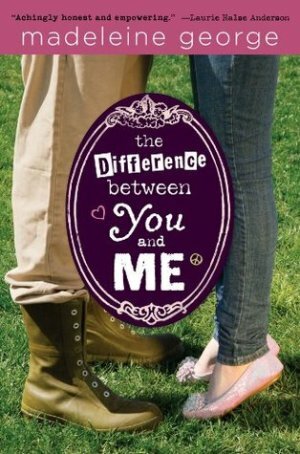 And I’d give this book to any teenager, gay or straight, who likes contemporary, mildly political romance. Review: This book, the first from Madeleine George, has some seriously high profile blurbs. Laurie Halse Anderson, Maureen Johnson, Robin McKinley and Nick Burd all offer glowing remarks on the back cover. Luckily, these remarks turn out to be totally deserved, because George’s first book is fantastic. The story is essentially about two girls, Jesse and Emily, and told from the alternating points of view of three, adding side character Esther in as an additional voice. Jesse is an out lesbian, who wears fisherman’s boots and publishes manifestos. Emily is a straight A student and student council vice president with a long term boyfriend. They have nothing in common. But every Tuesday, they find themselves making out in the library bathroom, and its like nothing either of them has ever experienced. “Arthur picks up Fran’s hand and kisses the back of it. She rolls her eyes at him a little, but she’s still smiling. ‘Are you guys about to make out?’ Jesse demands. The few chapters that were given to Esther – the ninth grader who befriends Jesse and enlists her in the fight against a Walmart-esque corporation taking over small business in their town – felt a little distancing to me. I liked Esther, but I was more interested in hearing from Jesse and Emily. However, I loved the StarMart plotline. StarMart is a thinly disguised Walmart, a superstore that promises low prices and huge selection with suspect business practices and treatment of workers. Early in the book, Emily reaches out to NorthStar, the parent company of StarMart, to get them to sponsor a school dance. But when, through Esther, Jesse starts to learn about the serious repercussions the corporation could have on the town’s small business, she ends up taking a public stand. I loved this plotline, because it gave us a really clear and specific picture of how a young person can become an activist, who creates meaningful change in her own community. But it also gives us an empathetic glimpse into Emily’s point of view. And, in case this review is making it seem like Jesse is totally blameless, having to put up with Emily’s antics, I really appreciated the flaws we saw in Jesse’s character. She can be sullen and snappy with her awesome parents. She ditches her best friend Wyatt for Emily and Esther. All three of our protagonists are incredibly believable teenagers, and therefore, incredibly flawed. But despite these flaws, Madeleine George has created undeniably awesome, Slatebreaking characters. A huge part of this story is an exploration of identity. What makes us the people we are? What makes us feel comfortable being those people? It can be a lot of things, as big as perfectionism and an important internship, or as small as a haircut. Sexual identity becomes mixed up in the rest of these identifiers of human-ness. But throughout the book we get glimpses into what determines identity for all of our characters and what happens when little things happen to shift the course of these identifiers. This is obviously a huge part of any teenager’s experience. We don’t know what will end up happening between Jesse and Emily after the book ends. But I ended the book caring so much about both of these characters and feeling absolutely certain that however they identified themselves in the future, they were going to do really great things. This entry was posted in Reviews, Young Adult and tagged Activism, Identity, LGBTQ, Local Business, Realism, Walmart. Bookmark the permalink.